Perforated stone object. 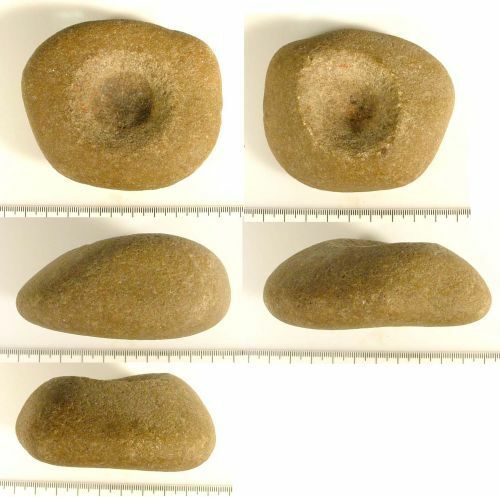 The mace head is made from a large pebble, roughly oval in plan and has a drilled hole in the centre on either side however they do not go all the way through. Both holes have a distinct darker stain beginning approximately half way down. The surface of the mace has been polished and is very smooth to the touch. The perimeter of the mace is also smooth and shows no evidence of useage. This object is likely to be the same as that recorded on the HER as ref. no. 64644, found in the 1960s. This present item was reported to PAS by the current owner, who was given it by the former landowner.